We were particularly excited to learn a couple of weeks ago that the Corvette ZR1’s 755bhp V8 is now available as a crate engine, but it seems Dodge has well and truly stolen Chevrolet’s thunder. By the best part of 250bhp. 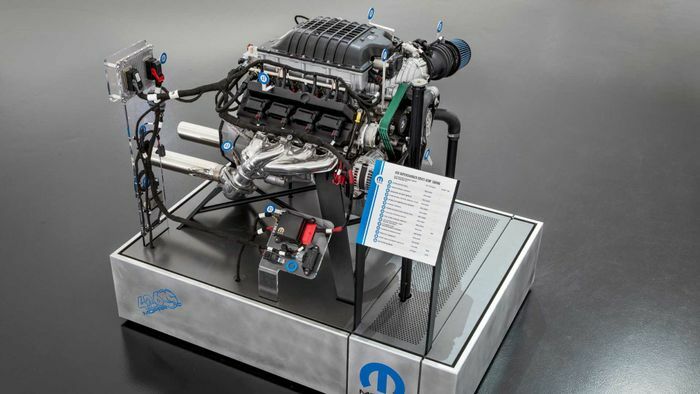 At the 2018 SEMA Show, FCA’s Mopar division has revealed a new engine for the most extreme of project cars, and it makes the ‘Hellcrate’ it showcased at SEMA last year seem a trifle underpowered. 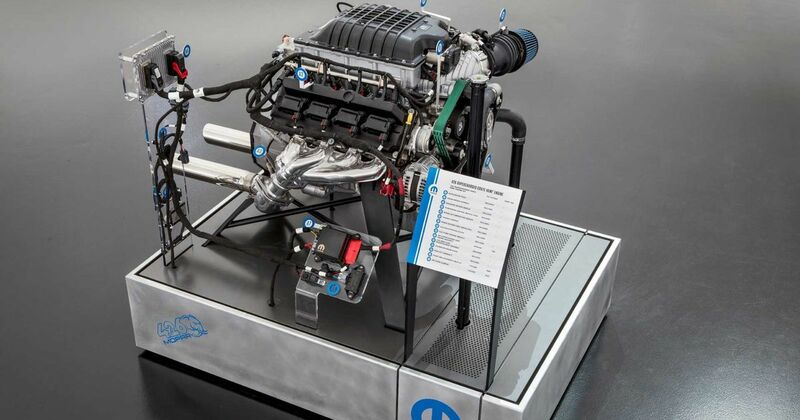 It’s called the ‘Hellephant’, and it’s a 426 (7.0-litre) supercharged Hemi V8 putting out 986bhp (or more neatly, 1000 metric horses) and 950lb ft of torque. Otherwise known as ‘plenty’. 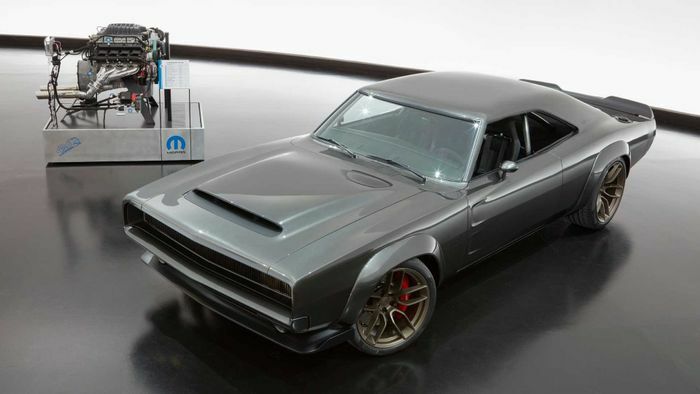 It shares its aluminium block with the NHRA Factory Stock-spec Mopar Dodge Challenger Drag Pak vehicles, and features a new supercharger with a “high-efficiency rotor”. The top end of the engine borrows heavily from the SRT Demon engine. It’s offered as an ‘Engine Kit’ with everything you need to get going. 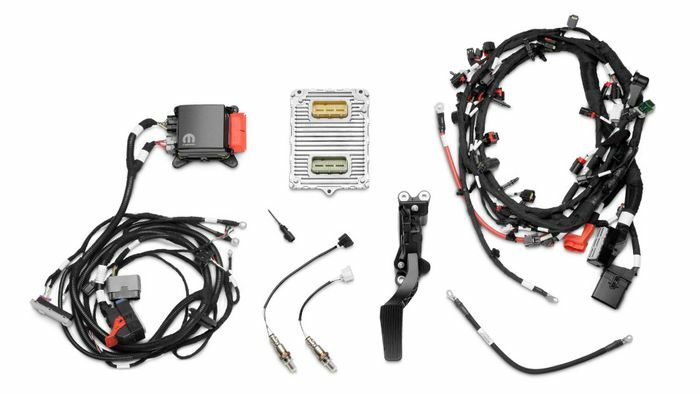 The ECU, wiring harness, throttle pedal - it’s all here. Opt for the Front End Accessory Drive Kit, and ancillaries including the alternator and power steering pump are thrown in. The term ‘Hellephant’ is derived from the nickname given to the original 1964 426 Hemi. It was widely referred to as the ‘elephant’, quite simply because it was massive and quite powerful. 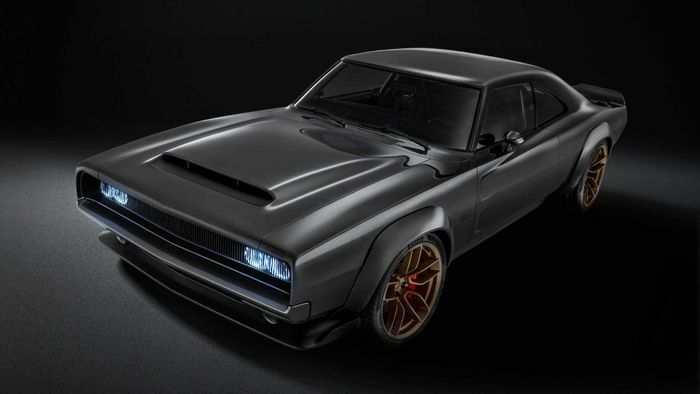 It’s fitting, then, that this near-1000bhp tribute has been showcased in a classic Dodge Charger. Specifically, the 1968 Dodge ‘Super Charger’ Concept you can see above. Finished in ‘De Grigio’ grey, the Super Charger has a wide arch kit along plus a bonnet with a Demon-style air scoop, all made from fibreglass. It still has the second-gen Charger’s famous pop-up headlight arrangement, only here, it’s a set of Hellcat lamps you’ll find hiding behind the grille. The 20-inch front wheels are from the Hellcat too, while the 21s at the rear are custom aluminium ‘Devil’ rims. Pricing for the Hellephant crate engine hasn’t been revealed yet, but to give you some idea of much much it might set you back, the Hellcrate is $19,530 plus $2195 for the Engine Kit.